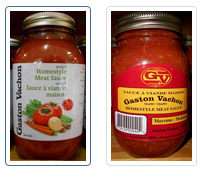 Ottawa, October 22, 2015 - Gaston Vachon is recalling Gaston Vachon brand Homestyle Meat Sauce from the marketplace because it may permit the growth of Clostridium botulinum. Consumers should not consume the recalled products described. The ministère de l'Agriculture, des Pêcheries et de l'Alimentation du Québec (MAPAQ) transmitted an alert to the news media today concerning affected products. Please click on the following link for details: http://www.mapaq.gouv.qc.ca/fr/Consommation/rappelsaliments/2015/10/Pages/3075.aspx.